Free breakfast and free Wi-Fi top the list of extras that make the non-smoking La Quinta Inn Sheboygan a top-ranked pick for our guests. At the two-story La Quinta 96 rooms and suites come with coffeemakers and flat-panel HDTVs with premium cable channels and plug-and-play capability. Free Wi-Fi and free local calling help you stay in touch while you're on the road. Enjoy a satisfying free breakfast before heading out for work or play. You can print boarding passes send a fax or answer emails in the business center and then melt away calories in the fitness room. La Quinta also features free parking and fax/copy services at the 24-hour front desk. Handicap-accessible rooms are available and pets are welcome for an additional fee. 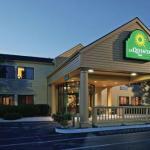 La Quinta is three miles west of downtown Sheboygan and two miles from the shores of Lake Michigan. Guests in town for an event at the John Michael Kohler Arts Center are eight minutes away and those on a campus visit are six minutes from the University of Wisconsin-Sheboygan and 20 minutes from Lakeland College. Many large companies are headquartered less than 20 minutes away. La Quinta is six miles from Sheboygan Memorial Airport and 64 miles from Austin Straubel International Airport. Dogs of all sizes are allowed. There are no additional pet fees. Dogs may not be left unattended unless they will be quiet and well behaved. Dogs must be leashed and cleaned up after.